Home › Economy › Sipilä’s social contract: is the government very clever, very inexperienced or simply dumb? Sipilä’s social contract: is the government very clever, very inexperienced or simply dumb? As the first step of our analysis of the Finnish government’s programme, we focus on the so-called “social contract” proposed by Sipilä to the social partners. The Finnish collective bargaining system is fairly standard for the Nordic countries, with negotiations of collective agreements that starts at the national level to secure the framework on wages and develop some topical social issues (training rights, gender equality, maternal or paternal leave, etc.) and more specific agreements implementing these guidelines at the branch level and then the company level. The state plays a rather modest role, facilitating the conclusion of agreements by proposing some changes to legislation to implement the agreements, or by granting public financing of some of the measures. ending the possibility of reduction of income taxes for housing loans. The words “ultimatum” and “blackmail” come to the mind when looking at the government’s programme: “By no later than 30 July 2015, the Government will make a proposal to social partners on measures (social contract) to reduce unit labour costs by at least 5% as well as on change security and a related education model. Government expects social partners to commit comprehensively to a social contract by 21 August 2015. If social partners accept the Government’s proposal, and the measures are clearly having an effect in March 2017, the Government will withdraw the conditional expenditure savings and tax increases it had decided”. Reducing the unit labour cost can mean 3 things which can also be combined: diminishing the salaries, increasing the number of weekly or monthly working hours and reducing holidays. This morning, Jyri Häkämies, the CEO of the Confederation of Finnish Industries, EK, said that he thinks the mandatory double pay on Sundays is outdated, saying that he thinks many people would be prepared to work on Sundays, which means less money every month for those who work on Sundays. This is going to be one main element in the “improved competitiveness“. So Finnish trade unions, even if they are ready to help Finland to regain competitiveness, are facing the equivalent of Sophie’s choice: choosing between bad treatments for workers, or punishment of large parts of the Finnish population. A big worry is to know if the social dialogue in Finland, which is an important part of the stability of the country, is going to survive the government’s policy. In order to add to the confusion, the Finnish newspaper Iltalehti citing an unnamed source in the government reported that there was a secret list of anti-trade unions measures that the government would decide if negotiation would fail: increased fines for illegal strikes, removing the tax deduction for union contributions and creation of an unemployment insurance fund that would compete with those managed by unions. Mr Sipilä has denied the existence of this list, but it looks now like a possibility, even if it is not a government’s official document. Almost at the same time, the new Minister of Employment (Jan Lindström, True Finns) suggested that any new austerity plan might include restoration of employer contributions to the Finnish social security, Kela, suppressed in 2010, for approximately € 1 billion. The unions said ironically that the measure, which would balance the efforts required from employees, should have been included in the official government’s programme. Again, M. Sipilä was obliged to disagree with his Minister of Employment and contradict him. When reading about it, it looks incredible, as this kind of violence in social relations has not been seen here in Finland in the past 40 years. The big question is to know if this is part of the Sipilä’s method , who would be the mastermind behind this plan to weaken the Trade Unions and oblige them to accept decisions that even the National Coalition Party would not have dreamt to implement. But there are big risks: the first one is unpopularity, but it is not necessarily bad for Mr. Sipilä in the first months of his mandate, and the first polls seem to show that the population does not hold it against him; the other possibility is to trigger a conflict which could take the form of a general strike, which would not be good for the Finnish economy; the trade unions may also accept the deal, but at the end the policy may be unsuccessful, as we will see in one of our next articles..
We do not believe this governmental team is really dumb, even if their knowledge of macro-economy and of social relations may seem limited. So the most probable hypothesis is that Sipilä’s government is not yet up to the task, as proved by these leaks and the ministerial declarations. Sipilä is obliged to contradict publicly his ministers, as noted by some observers and a number of newspapers. Even the recent publication by the Ministry of Finance of a paper showing that the recently agreed upon government cutbacks and tax changes will affect negatively mainly pensioners, families with children, and the unemployed, and will be favourable for the richest part of the populations, did not demonstrate any trace of communication skills in the new team (read the paper here). 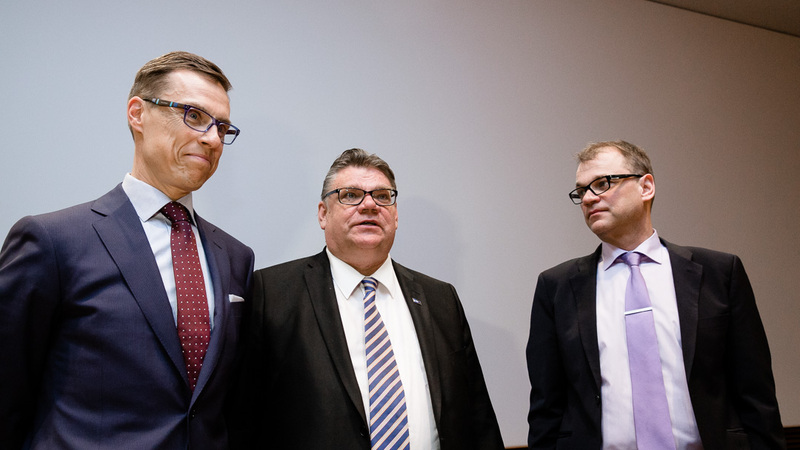 ‹ How the international press has reacted to Sipilä’s coalition?